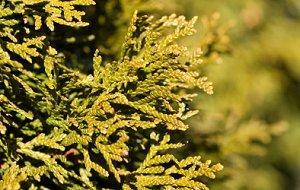 Cedar Point was named for native cedar trees. The history of Cedar Point is filled with as many ups and downs as the park's roller coasters, but that intricate history that has made Cedar Point amusement park a popular destination for more than 130 years. Long before Cedar Point existed, the land on which one of the world's best amusement parks sits was filled with native cedar trees and wildlife. The peninsula was home to different Native American tribes and was initially part of English colonial lands. Because of its clear waters, it was a superb fishing ground, and from the 1840s through the 1870s much of the land was leased to local fishermen. During the Civil War, the peninsula was a strategic outpost for Union artillery but the area saw no battle action. In 1870, however, the peninsula's history changed drastically with the building of the first resort amenities. In 1870, a bathhouse, beer garden, small dance floor, and children's playground were the first resort facilities to appear at Cedar Point. For several years these small amenities drew meager crowds interested in a day's getaway, but in 1878 the park began to grow as larger bathhouses, picnic areas, boardwalks, and other features were added. Throughout the late nineteenth century, Cedar Point became known as an affordable summer retreat as modest attractions were available at cheaper prices than larger parks in metropolitan areas. 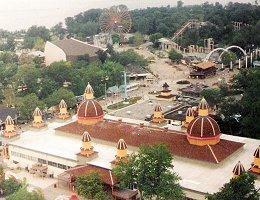 During this early history, Cedar Point's popularity and success was due to nearly constant expansion. New attractions -- bowling alleys, walkways, flower gardens, baseball diamonds, musical entertainment, fireworks shows, etc. -- continually attracted new visitors. More thrilling features such as the lakeside water trapeze began to hint at the park's future as an amusement park, and the first roller coaster - the mild Racer - was erected in 1902 to thrill patrons with its undulating dips. 1905 was a pivotal year in the history of Cedar Point - the iconic Hotel Breakers opened. Luxurious rooms and resort amenities such as a barber shop, tailor, beauty salon, and extensive meeting rooms made the resort a popular destination for guests interested in spending several days enjoying all Cedar Point had to offer. In the same year, the Coliseum was opened and the large dance floor and stage would host thousands of revelers and popular bands during the early part of the twentieth century. In 1906, the midway saw its first concession stands, games, and small amusement rides, which were at the time owned and operated by independent contractors. With more and more guests visiting the resort and craving ever more outstanding attractions, additional roller coasters were built, including the Dip The Dips coaster in 1908 and the Leap the Dips coaster in 1912. The Great Depression hit amusement parks hard, and for the next twenty years many small parks went bankrupt and were abandoned. Cedar Point's attendance dropped, many attractions degraded, and eventually the roller coasters were razed. The park's outlook was bleak, but by adapting with smaller attractions and continuing to rely on its superb beaches, the park survived this grim period. After World War II many of the park's attractions were neglected but a steady stream of convention groups and meetings still took place at the park. In 1950, new management officials began restoring the park and changed its focus to a more family-oriented destination with the addition of Kiddieland and other attractions designed for younger guests. This tied into the post war baby boom and helped the park move through the 1950s with mild expansion. During the 1960s, attractions familiar to today's Cedar Point guests began to appear. The park was enclosed and a pay-one-price admission fee was instituted so guests could enjoy the Dodgem cars, CP & LE Railroad, Sky Ride, Cadillac Cars, and Cedar Downs carousel without purchasing additional tickets. In 1964, the Blue Streak wooden roller coaster opened, and today the coaster is the park's oldest and one of its most beloved. Other attractions during the 1960s included the opening of the Space Spiral in 1965 and Frontier Town in 1968, both of which remain popular attractions today. In the past few decades Cedar Point has grown from a modest park to one of the world's most popular thrill destinations. The 1970s and 1980s were the era of the Amazement Park, when Cedar Point continued to amaze guests with new, innovative attractions added almost yearly. The Sealand Aquarium opened in 1970 and would delight guests with aquatic attractions for more than 20 years, and in 1976 the Corkscrew roller coaster opened to thrill guests with its three inversions. 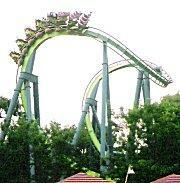 When the Gemini roller coaster opened in 1978, it was the tallest roller coaster in the world. Other attractions included White Water Landing flume ride in 1982, the Demon Drop free fall ride in 1983, the soaking Thunder Canyon raft adventure in 1986, and Soak City water park in 1988. The Amazement Park era culminated with the spectacular opening of Magnum XL-200 in 1989, the first roller coaster in the world to reach heights taller than 200 feet and speeds greater than 70 miles per hour. From the 1990s and into the new millennium, Cedar Point has become known as America's Roller Coast for its wide selection of amazing scream machines. Among them are the inverted Raptor, the stand-up coaster Mantis, the world-record breaking Top Thrill Dragster, and many others, with new plans for amazing attractions always in development. For its longer than 130 year history, Cedar Point has kept a tradition of continual advancement and development that has lured guests back year after year. With new resorts, faster rides, family attractions, world class entertainment, and other features, the history of Cedar Point will continue to be a colorful and thrilling one for many generations to come.